Craftsman is a line of tools, lawn and garden equipment, and work wear born in 1927 when Sears decided to create a superior brand of tools; the tools would have to meet the most rigorous set of standards to earn a place in the Craftsman line. The brand first appeared on a line of saws. 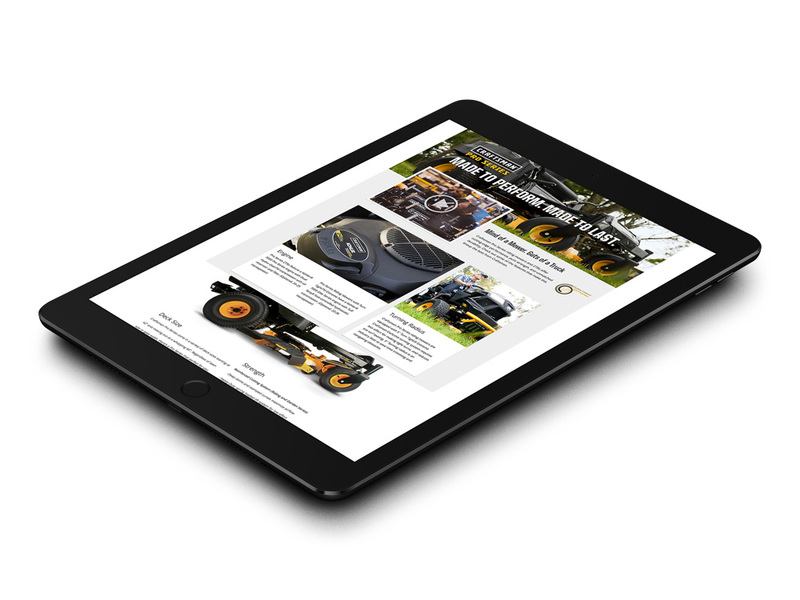 Craftsman.com is the digital brand store and primary brand marketing/knowledge/shopping source for people wanting to learn & shop Craftsman products, and connect socially with like minded crafters and tool enthusiasts. The digital wing for Sears was in the midst of migrating from a diverse collection of inconsistent brand, e-commerce & micro-sites for all brands under the Sears Holdings umbrella. This inconsistency made experiences very expensive and cumbersome to maintain and innovate. Each had their own form of a CMS and UI and UX standards. To fix this issue, Sears decided to use Adobe Experience Manger, which was a huge undertaking. With the help from a strong team the task of finding a solution to deliver a set of AEM component based templates that were robust enough to accomplish goals set in front of us. With goals set it was time to identify the key pieces that needed to be put into place. I worked with the information architect to brainstorm how we could get the most efficient and smart product up in the shortest amount of time. Previously, We incorporated and leveraged optimal performing product detail, product listings, search & checkout processes with minimal changes from original Sears and Kmart layouts. This decision to re-skin pages in-turn let us focus design and development resources on key areas to the AEM migration. 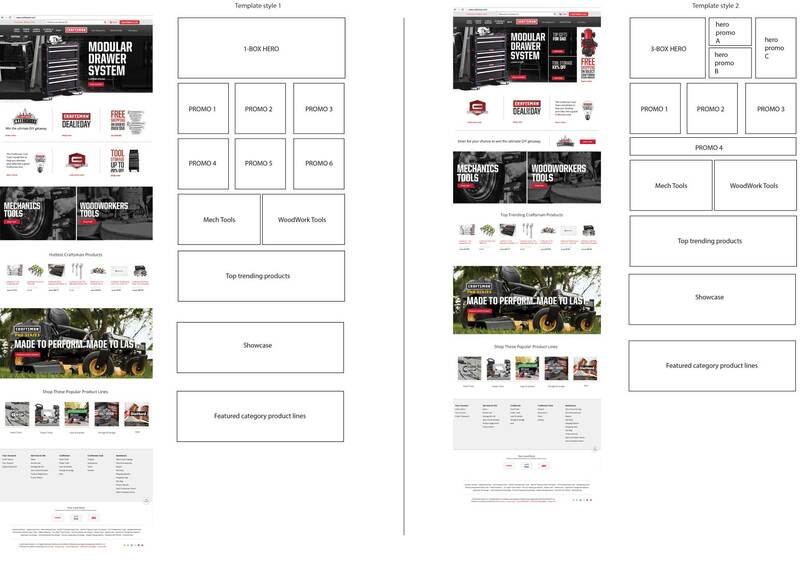 With middle to bottom of funnel pieces finalized, I was able to concentrate on how the brand was communicated in the homepage, category and special product pages. Using primary brand colors to communicate strength and letting the beauty and shape of the tools to determine design, layout came quite easily. As the Lead UX/UI designer on the project, featuring a flat layout and native controls increased speed and performance. Pushing AEM to perform in ways it wasn't intended to be used came easily for me. I associated it to working on a puzzle but being able to mold the pieces to how I see fit to achieve maximum performance. Visualization of the problem and understanding how the solution will be built is an abstract that I am extremely comfortable with. Through skillful ingenuity, I earned the trust of fellow teammates and KCD stakeholders. With that trust we were able to help boost Craftsman.com performance with revenue up 22%, revenue per visitor up 42%, and conversion up 18%. Website design and content © 2017 David Schap.